The dog days of summer are officially here. And Peppermint will be the first to tell you that temperatures in the triple digits are no fun, especially for a fluffy Jack Russell. While Peppermint has always preferred to be an indoor dog, these past few days she doesn’t even want to venture out for a walk around the yard. 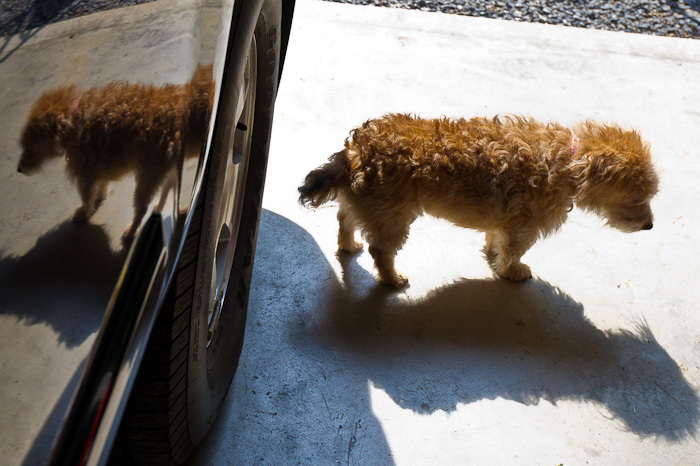 She’ll barely leave the shade of the garage, and even then it’s only if she believes she might be heading from the air-conditioned house to the air-conditioned truck. But she’s really just a reflection of us—always seeking the creature comforts in life. Oh, yes, the dog days of summer. That has got to mean resting in the shade and taking naps–any other activity in the summer is just crazy, especially the summer that has been hitting the country this year. I can remember each summer when I would drive home to Los Angeles, CA from Corpus Chrisit, TX. Some of those drives were in a 1965 VW bug with no air conditioner–my poor dog. When we stopped for a potty break, the sidewalk was often so hot it burned his pads! So we traveled at night and found hotels that take dogs and doused him with water to keep him cool. Oddly fond memories, but the dog days of summer are not really nostalgic for me. Great photo–captures a lot of the weariness of summer heat.